The Metropolis 1XU Server is a cost effective, easily integrated solution for bringing real-time DV to uncompressed HD server to any broadcasting and video production environment. Metropolis' Video Server is an architecture-independent availability management solution focused on proactive management of service groups (application services). It is equally applicable in simple shared disk and Starnet SAN (storage area network) configurations of up to 32 servers and compatible with single server, parallel, and distributed applications. Cascading and multi-directional application fail over is supported and application services can also be manually migrated to alternative servers for maintenance purposes. Metropolis server provides a comprehensive availability management solution designed to minimize both planned and unplanned down time. - Supports full bandwidth 10-bits (12-bit capable) for 2K, 1080i, 1080p, and 720p formats. - Mixed video/audio format support RGB 4:4:4 and 4:2:2 formats to ProRes, DNxHD, IMX, DVCPro HD & H.264 embedded hardware acceleration HDV and HDCAM. 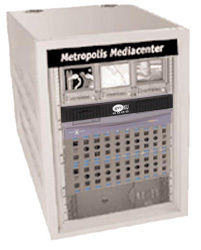 The Metropolis 1XU Server is a rugged, low profile rack mountable system occupying less than 19" deep rack space. It's an innovative, completely rugged system, designed with open architecture and extremely low power and noise consumption, and providing you the ability to operate the system and access data from any network with simple administrative tools. Users can quickly capture into shared network of high def, even uncompressed data, and share the entire project in real time. Since all the data are accessed over the fiber channel network, clips of any length and size in either manual, scheduled or remote mode can be recorded or played back from multiple stations. At only 1.75" high, several 1XU Servers can be stacked in a compact area offering 16 concurrent recording options, on any format of storage Gigabit, Firewire800/400, and Fiber. For online storage, the Metropolis 1XU Server is designed to work with the latest GVSAN and other SAN technology. Connect via 2-4GB fibre channel to the Nomadic1XU-4U or 3rd part fiber channel storage and Metropolis 1XU Server running GVSBASS (broadcast automation software solution) and you have a complete solution for digital Server, video assist, ingest, and broadcast play-to-air at very low cost. GVS offers one of the most powerful Video Server products with recording capability of direct HD or SD SDI recorder to same SAN storage while you are editing uncompressed video and playback on another. It also features simple integration with your 4:2:2 digital and Film Camera, directed film recording and the ability to capture multiple cameras in real time with a simple record and play-back button. Capture with accurate time code, and overlay options, with waste editing capability and removable media that can be easily transported from seat to edit/preview stations, with shared storage offering number of different formats from Uncompressed HD, SD, ProRes, ProRes HQ, ProRes 4:4:4:4, DNxHD, IMX, MPEG4, DVCPro HD, DV50, DV down to H.264.